Click Here for Data Results and Reports for the Kawishwi Watershed Protection Project. Pictured below is a drawn representation of the Kawishiwi Watershed. For an accurate, detailed map of the watershed click on Detailed Map (PDF). The Kawishiwi Watershed drains an area of 1,200 square miles which flows through various rivers and lakes before exiting at the Winton hydroelectric dam. The primary source of inflow to the White Iron Chain is from Birch Lake, the outflow of which is controlled by a dam. 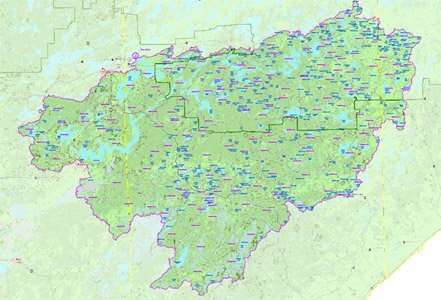 Other sources are the Bear Island River, draining 69 square miles into White Iron Lake and the North Kawishiwi River into Farm Lake. During low flow conditions, i.e., less than 2,000 cubic feet per second (cfs), the elevation at the hydroelectric dam, Garden, Farm, South Farm and White Iron Lakes are an essentially flat pool elevation of 1,388 feet above sea level. Above 2,000 cfs the levels in White Iron Lake begin to increase significantly as the flow increases due mainly to the constriction at the Silver Rapids Bridge. At a flow of 16,000 cfs there was a difference in elevation of 7.4 feet between White Iron Lake and the dam at Winton.